Mar. 23rd 2008 - general update of the pic. refined overall detail of the pic and quality of the print. Sept. 19th 2008 - update of the pic. clouds detail changed. The meaning of the pic is to show the kind of path we're all going. On the left side we have the oldish, familiar looking environments. While on the right we have the monstrous huge futuristic city that seems to literally eat the people, their lives and lets them appear soooo small that they almost don't count anymore. The old bridge is a kinda symbole to show that both parts are still connected and that only you alone decide to take that walk into the future or not. On the other hand... it's just a cool sci-fi based artwork. First of all i want to tell those super critique folks that this pic is far from perfect, i know that. There's, once again, lots of experimental stuff in it. It's very different to the stuff i ever did before. Basically it's a very big huge mo0onster photo manipulation. 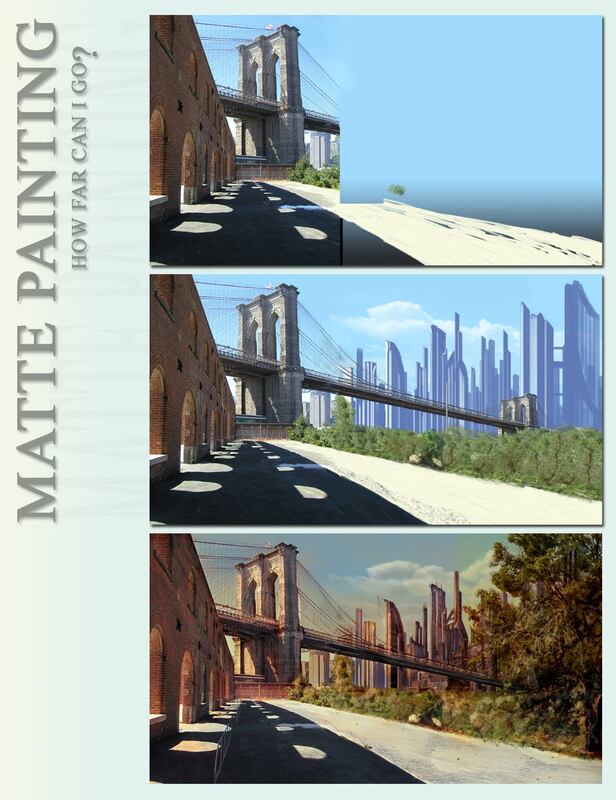 You ask yourself why it's call matte ' ainting' then. That's what i ask myself too sometimes lol. But it's true. In some ways it is a painting. In others not. Since you work with a tablet and pen... you first block in all the stuff you want to have in your pic. That's the painting part. Once you nailed down the composition and main elements, you move into the manip part and the painting work takes a step back. Once the manip part is done, you move into painting again to add detail where it's necessary. Todays digital matte painting is a variety of mediums. From usual photos to high detail 3d to excellent paintings... all combined in a single pic. You better ad the Delorean here. It's incredible what the sci-fi films can predict!! OMG this one is beautiful! wow this looks good. awesome vibe i get from that one. I am new to this and have been inspired!.. Thank you! oh wow, this is sooo cool! I loove it! man those are the building i was thinking in 5001.
omg....i thought you just added the car and the MAN to this and i said to myself..yeah it's pretty realistic...but then i looked longer and realized..omg...it's a whole friggin picture!!! this is before i saw the rest of your gallery. >< WICKED. Wow! Amazing, looks like a lot of hard work! amaZing. and..wow! you put a little work into this one, eh? from a modern present, to a past where bricks are crumbling and weeds are growing, and the cars are out of gas. i suppose its how you look at it, right? Amazing work, like an after-fallout-era! this one has always been a personal favorite of mine; it reminds me of back home. great job. oh this is cool...I like the differances! I like how the left side of the image draws your eye (well, my eye at least) more than the right side, which seems very impenetrable...it really goes with what you were looking for. What I'm curious about, though, is what is the make of the car, and does it mean anything? Does Manhattan Sink in the future, I dont remember seeing any mountains on the Jersey Side. Wie ich früher schon mal gesagt hab: das ist eines meiner Lieblingsstücke von dir..
Allerdings gibt es immer noch zwei Sachen, die mich explizit daran stören.. Beide haben mit dem Auto zu tun. 1. Warum sind die Bremslichter zu sehen? Sitzt jemand im Auto und steht auf dem Bremspedal? Denn es wirkt als sei derjenige, der am Auto steht, auch der Fahrer. Ist also etwas irritierend. 2. Das Nummernschild sieht sehr französisch oder belgisch oder auch britisch aus (generell: europäisch). Da das aber offenslichtlich im New York der Zukunft spielt (also in den USA), sollte das aber eher ein anderes Nummernschild sein (nicht Gelb und nicht so lang, eher höher - US-Nummernschild eben ). Sind nur kleine Kritikpunkte, die mir aber aufgefallen sind. Ich hoffe, du nimmst sie nicht persönlich - denn das ist die Kritik nicht. niiiich übertreiben junge *g* das mit den bremslichtern könnt stimmen. hab die karre damals irgendwann mal auf der autobahn fotografiert. das nummernschild hab ich eigentl unkenntlich gemacht. ok es schimmert gelb durch, na und? DAS IS DIE ZUKUNFT MAN! da hat die ganze welt nur eine flagge... stars n stripes lol ich liebe aus der luft gegriffene erklärungen, die im kontext mit einem bild, tatsächlich funktionieren könnten. Hahaha, damit kannst du mich aber nicht schocken oder verwirren! Bye bye und lass es dir gutgehen! What a wonderful piece of art. Keep the good work. genial, die Idee ist spitze und die Ausführung 1A. Das hier ist definitiv mein Lieblingsbild von dir. Very nice, but the shadow of the car sounds awkward, while the perspective of the bridge looks a bit strange to me. I love the colors though, nice! Is that the Manhattan mountain range I see in the background?